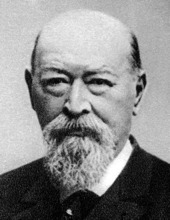 Nineteenth-century musician, Franz von Suppe experienced success in a variety of settings during his lifetime, but is remembered for his work as an opera composer. Born of Austrian and Belgian descent, his father discouraged his musical talents, but the young Suppe found support from local musicians. Upon studying law in Padua, he explored music, hearing works by and meeting Donizetti, a distant relative, Rossini, and Verdi. In 1840, he took an unpaid position conducting in the Theater in der Josefstadt. It was there that his first complete opera was performed, gaining attention for the skillful orchestrations, languish melodies, and musical surprises. In subsequent years, Suppe continued writing not only for the Theater in der Josefstadt under Franz Pokorny’s direction, but also for other theatres Pokorny was affiliated with in Baden, Odenburg, and Pressburg. Suppe could also be found on stage in roles such as Dulcamara in L‘elisir d’amore. Suppe accepted the position as Kapellmeister at Pokorny’s Theater an der Wien in 1845, then moved to the Kaitheater in 1862 and the Carltheater in 1865. In addition to conducting, his compositional output included various masses, symphonies, vocal works, incidental music, and operas, the most successful being Boccaccio in 1879. He also wrote a requiem for Pokorny’s memorial in 1855. Suppe experienced considerable fame and in 1882 retired from his conducting posts. He continued to compose, however, many of his final works being sacred. Suppe’s original success came from his work as a composer of Viennese operetta, though he is now known best for his overtures, some of the most popular being Morning, Noon, and Night in Vienna, Poet and Peasant, Queen of Spades, and Light Cavalry. Also of note is his song, O My Austria from The Mandrake, which is a cherished patriotic song.